Plastic Transfer Board Ideal For Self Transfers. 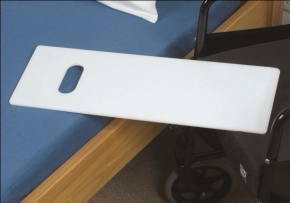 Enables people with good upper limb strength and sitting balance to slide from one seated position to another. These lightweight plastic transfer boards are ideal for self-transfers when bridging small gaps. Tapered ends and a hand grip assist in positioning and low profile anti-slip pads on the underside prevent the board from slipping during the transfer. Smooth surface for easy sliding transfers. Wipe clean with mild disinfectant.